It's barely been running for a few hours but it looks like the Steam Dev Days in Seattle is kicking off on a high note. The conference is solely for developers so we've been following along on the Twitter-verse and many bombshells have been dropped. According to Becky Taylor, community manager at Signal Studios, Valve "wants other properties such as TV, music and software on Steam Machines." Update: It seems Anna Sweet, a Valve employee in charge of general business development, was the original source who stated, "We want to add music, movies and TV to SteamOS before it gets released to consumers." Adding these features puts Steam Machines even closer to its console competition and means we'll be getting a lot more than gaming on the PC friendly box. Valve had stated previously that it was working on bringing a full entertainment suite to SteamOS, offering users music, TV and movie streaming, not just PC games. However, bringing the idea up with developers is a sure sign Valve is serious about Steam Machines becoming more than just gaming consoles. Plus, someone has to develop the various entertainment apps, right? We've reached out to Valve for further comment and will update this article when we hear back. 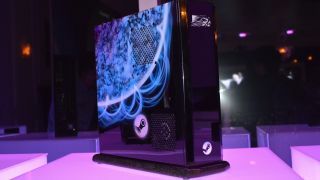 Look for Alienware's Steam Machine this September.